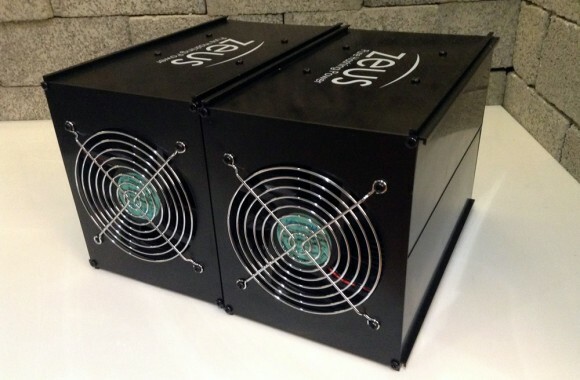 The company Zeus has released an update on their website about the current progress for the ZeusMiner Scrypt ASICs that they already promised to start shipping by the end of this month. They have just announced that they will be starting to ship the first 500 orders from May 20th to latest May 25th, so apparently they are a bit ahead of the previously announced schedule to start shipping by May 31st. Another interesting thing is that the company will be releasing the miners not pushed to the maximum and promises an update that will allow users to further increase the hashrate later on. Also the company has announced that they will give out a second free miner, one that is a level lower in the product line than the ordered by the customer, so only the Blizzard customers will not get a second free miner with their orders. There is also a not so good quality video published from the company’s assembly factory in Shenzhen, China that you can see embedded above. So far things are looking pretty good for Zeus and their ZeusMiners and the only problem we currently find is that they do not have an official distributor in Europe for example to make it easier to get their products as they will be shipped from China. We have decided to order one of the smallest 1.2 MHS Blizzard ZeusMiners in order to be able to test it and publish our hands-on experience with the Zeus Scrypt ASIC chips that are also used in the bigger miners. There are two options to pay directly to ZeusMiner, with BTC/LTC via CoinPayments or with Direct Bank Transfer, obviously using coins would be easier and faster and with no extra taxes from the bank. The price of the small Blizzard ZeusMiner is $199 USD and the shipping we got to Europe was $53.98 USD, so pretty steep price for shipping a small package from China, unless express courier service is used. Our order number was #2054, so apparently a lot of people have ordered Zeus Scrypt ASIC miners already with the company close to start shipping the actual units. We’ll keep you updated how things progress with our order.